Despite the enviable regular-season success that Alex Rodriguez has enjoyed throughout his 16-year career, including 12 All-Star appearances, 583 career homers, and three AL MVP awards, he had always struggled in the postseason. In fact, some would say A-Rod had a King Kong size monkey on his back that only Fay Ray could love, and everyone in New York came to dread each year. 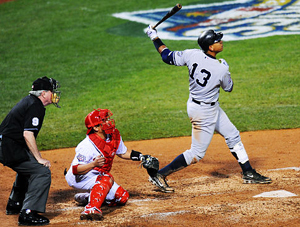 Prior to the Yanks’ 2009 playoff opener against The Twins, A-Rod was 8 for 59 (.136) over his last 13 postseason games. In those previous 27 playoff at-bats with runners on base, he was 0-for-27. Talk about having no place to go but up…and that’s precisely what Rodriguez proceeded to do. In Game 1 of the ALDS against the Twins, he went 2-for-4 with two huge RBI singles that helped The Yanks to a 7-2 victory. Nice start said the critics, but can he keep it going? Alex flashed his home run power with game-tying blasts in both Games 2 and 3 of the ALDS. The Yankees went on to win both games and put an early end to Minnesota’s Cinderella playoff berth. The long balls (3) and RBIs (6) kept coming for A-Rod in the ALCS, but it was in Game 4 that he really flexed his muscle with a monstrous game, going 3-for-4 with 2 RBI, including a two-run home run off Jason Bulger in a 10-1 Yankees victory. Through the first two rounds of the postseason, Rodriguez was 14-for-32, (.437) with five home runs and 12 RBI. Not too shabby for a guy who had a reputation for choking in the big games. Then, in the biggest games of them all – The World Series – Alex came up big when the Yankees needed him most. With the Series tied 1-1, he stepped up in Game 3 and hit a two-run shot that glanced off a camera and had to be reviewed by the umpires to get reversed from a double to a home run. But it gave the Yankees the scoring and emotional boost they needed to carry the day 8-5. In Game Four of the World Series, he laced an RBI double that put NY ahead for good. Solid pitching, defense and some timely heroics by his teammates (especially Hideki Matsui) helped the Yankees claim their 27th World Series crown. Along the way, A-Rod thrilled his fans worldwide while also silencing many of his critics by finishing 5-for-20, hitting .250 with one home run and six RBI on baseball’s biggest stage. 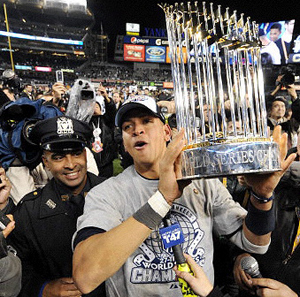 For the entire 2009 postseason, A-Rod finished 19-for-52, hitting .365 with six home runs and 18 RBI. When the Yanks needed A-Rod to get a big hit, he got the big hit. Which, after all is the defining characteristic of 500 Home Run Club® members. "I think everyone is looking for a profound answer, and I don't have one," Rodriguez said after the champagne poured and tears flowed. "At the end of the day, I'm content. I'm happy, both on and off the field," Rodriguez said. "We've waited a long time for this, and '04 obviously made it a lot more special…A lot sweeter." And sweetest of all was the Championship parade through the Canyon Of Heroes and a ceremony at News York’s City Hall Plaza, where Mayor Michael Bloomberg presented the Bronx Bombers with the Keys to the City. "I've never seen so many people collected in one place," A-Rod said. "You have to experience it for yourself. It was incredible. Like nothing I've ever seen before."